If you've come here looking for a rant about how I loathe my period (except when it's there to remind you that you are not, in fact, preggers) well, you'll just have to wait a few weeks on that one. This is a different kind of monthly reminder. When Kaden was a baby, I took a lot of pictures and videos of him. This was before I even entertained the idea of becoming a blogger. I was always right behind him with a camera to capture those candid, and not-so-candid, moments. I love looking back on them and remembering that point in time and the space I was in. It's part of the reason why I continue to document everything now. Have you checked out my Instagram photos? Just follow me while you're there, too. When Liam turned one month old, I decided I wanted to photograph him every month, for one year. I wanted to see just how much he changed in a short period of time AND I needed another reason to take even more pictures. I am also discovering that my creative juices begin to flow whenever I seek inspiration for his next monthly picture. Liam is six months old now. 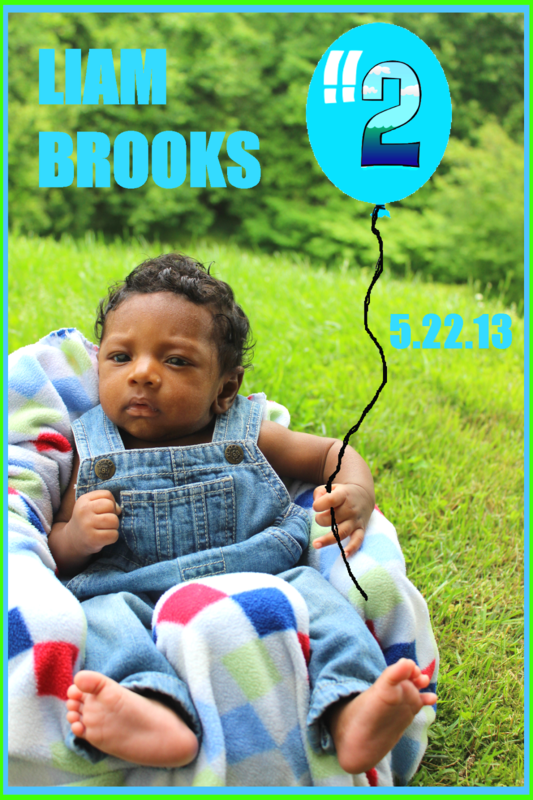 In the beginning, I was marking his "birthdays" by counting the weeks. That became a bit confusing, so I just switched over to the 22nd of every month. 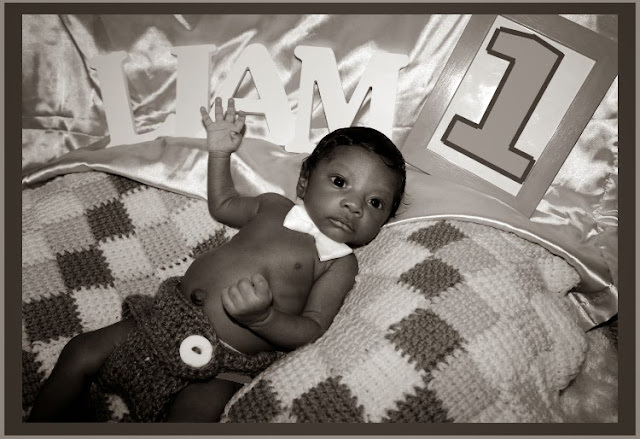 Take a look at the first six months of Liam's life...in picture form. One month - This felt like a Cinderella moment. I literally waited until eleven o'clock at night to start this tradition of taking monthly pictures. I was so determined to stay on date, I made sure I posted this picture of Liam before the clock struck midnight. I have no clue what his theme is. He looks like a Chippendales dancer. Two months - This was a casual day outside. Liam is a rather fussy baby. Any sort of distraction to his normal routine makes him not-so-pleasant. I decided to take him for a walk outdoors. This picture was before my creativity kicked in. I gathered his Bumbo (which he was too young to sit in), threw a blanket on top and snapped a few pictures of him. I relied on photography editing and added some drawings to the picture I shot. He was not thrilled or phased. Three months - We call Liam, "Li" (pronounced Lee), for short. I figured the words "Li" and "three" rhymed, so I went from there. 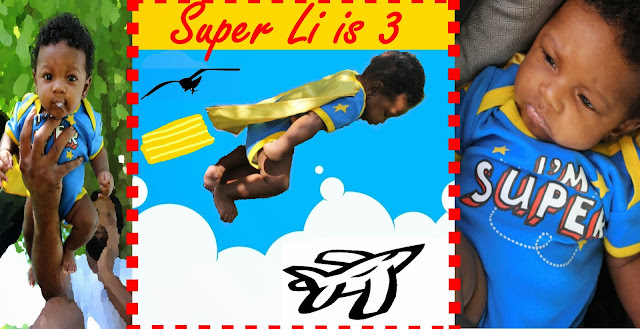 I wish you could have seen how I attempted to make the cape on his onesie "fly". Let's just say there were clothes pins, fishing wire, his Dad's hand and a trash bag involved. It was like being on the set of an action movie. In the end, I let go of some of my ideas and ended up with this SUPER picture of Liam. Four months - By now, I was looking forward to coming up with new ways to display Liam's growing self. I kept a close eye on the calendar and made sure I has ideas always flowing as the 22nd neared. I stayed with the rhyming theme again, this time playing around with the words "four" and "score". Because the word "score" is often associated with sports, I ran with that theme. 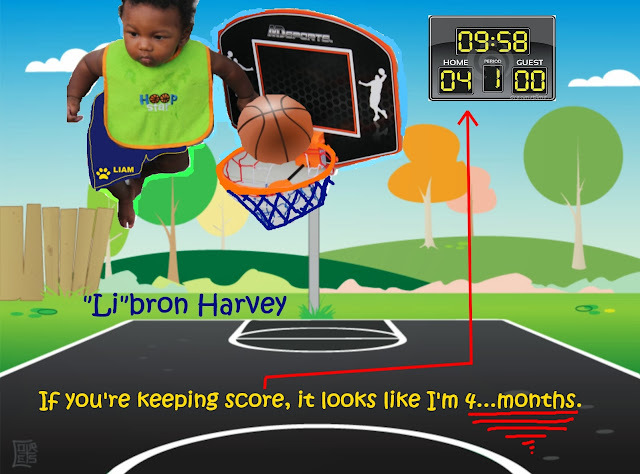 To go even farther, I used my son's nickname, "Li", to attach it to Lebron James's name. Thus, coming up with the name Libron Harvey. Five months - I was in the car rocking out to the radio. They were playing rapper, Notorious B.I.G., songs. I was just thinking about how great of a rapper who was and some of the songs he gave the world that are still so relevant today. To top it off, I had started referring to Liam as "Biggie Smalls", which is also another name that Notorious B.I.G. went by. I chose this for my son because he was growing so fast, but he was still tiny at the same time. 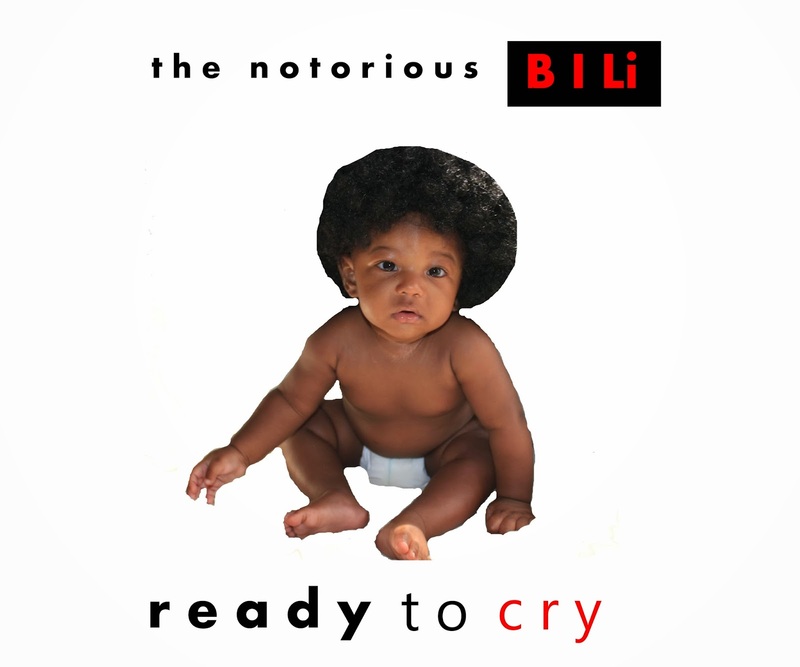 I thought back on the famous CD cover of one of Biggie's albums and decided it would be perfect to replicate. Though not quite the same, I captured the essence of the cover, even forcing my baby to wear an Afro wig. LOL!! Six months - This, by far, was the least creative I have been in the process. I completely forgot that it was the 22nd as we packed up the family and headed to my cousin's house to watch some football for the day. I had to keep it simple. I snapped a picture of Liam, in his Carter's football outfit of course, holding a football. Because he was six months on that football Sunday, I realized he was the same age as a touchdown. Six points, six months, on football Sunday. Perfect! I took a few pics, but posted only one. I can only imagine what I'll come up with in the next six months. I guess Liam has no clue what he signed up for when becoming my son. I know how my face lights up when I revisit old pictures of myself of my family. I am sure he will appreciate having something to remember his childhood. Well, for the most part.